Taking his inspiration from handcrafts, traditional African prints and patterning, Christopher Bailey has produced an altogether ethnicically feeling collection for Spring/Summer '12. A strong 70s influence ran through the show with oranges and blues featuring heavily. Trench coats in various forms, including a leather version with shearling collar, appeared throughout. Loose knitted bobble caps also gave a nod to the bygone era as did cardigans and denim jackets. Crisp white shirts featured fun applique felt details and bold printed tshirts with geometric patterning added in a more contemporary feel. This was again accentuated through the continued use of slim cut trousers and oversized elements. 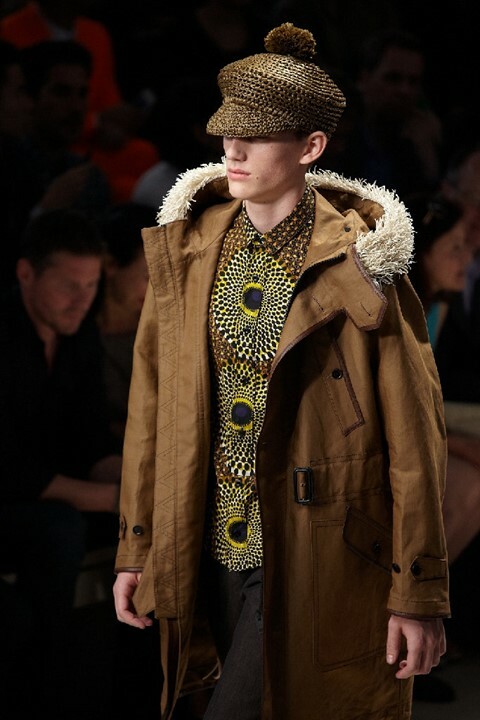 The geometric patterns and block prints showed up on a number of pieces including a full print shirt and trousers. While the direction was a new one for Burberry Prorsum, Bailey has left in enough of the brand's signatures to maintain loyalty to its customers. Innovative fabrics, including what looked like a synthetic snakeskin have been included, as have bold lapels, military influences and a nod towards the formal yet ever so slightly avant-garde.